MBALE–Mbale town has come to a standstill this afternoon as people have deserted work and business to concentrate on watching proceedings at Parliament as Speaker Rebbeca Kadaga struggled to contain a house of rowdy MPs who were against the lifting of the presidential term limit. Mbale is usually a busy town in the afternoon, especially along Republic Street, Naboa road and Kumi road among others with boda boda motor cyclists and cars swishing around, but this afternoon, a baby could have crawled across the road twice as all were nearly empty. People instead crowded at areas plugged with television sets like bars and restaurants, appliance shops to witness live feeds from the national legislative assembly. Boda-boda motorcycles were packed as owners craned their necks at nearby bars to witness history unveil at Parliament. “We have to put business aside to witness the fate of our country,” One boda boda motorcyclist, who preferred anonymity, told PML Daily. 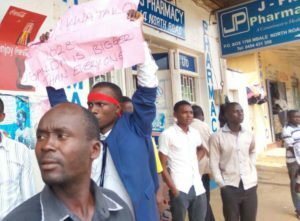 Mbale town was a scene of violence this morning as police struggled to foil a demonstration by youth who were protesting the amendment of Article 102 (b) of the Constitution to allow President Museveni run for another term after clocking the constitutional limit of 75 years.